I just got back from a very humid weekend spent exploring Horse Canyon in the Needles District of Canyonlands National Park. I’ve been trying to get back into Horse Canyon for the last two years but the road has been washed out and closed for that long. When I received word a few weeks ago that the road had finally been reopened, I wasted no time and planned a trip out there…who knows when the next storm will close the road again? 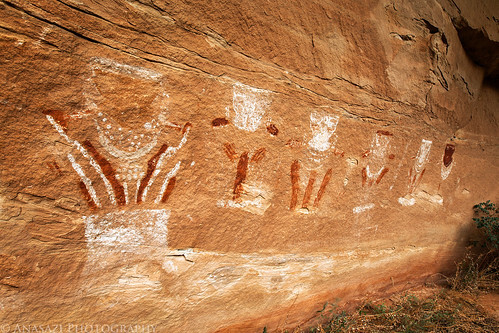 One of the main reasons to get back into Horse Canyon was so that I could finally visit the famous Thirteen Faces pictograph panel. This photo shows six of the Thirteen Faces, although you can really only see ten of the faces to begin with.